Will Democrat State Attorney Win Reinforce Safety Net for Florida’s Republican Governor Rick Scott and Attorney General Pam Bondi? Tallahassee, FL—Democrat candidate Jack Campbell’s upcoming position as Florida’s 2nd Judicial Circuit State Attorney may just be reinforcement of Willie Meggs’ decision to not prosecute Governor Rick Scott for violating Florida’s Public Records Law. In 2012, both Governor Rick Scott and Attorney General Pam Bondi were asked to assign a special prosecutor in the case involving 17-year-old, DeShon Thomas, a Black male freshman at Tallahassee Community College. DeShon Thomas had been charged by Leon County Sheriff Larry Campbell with numerous crimes, including two counts of 1st degree murder, possession of a firearm by a juvenile delinquent and solicitation to commit 1st degree murder. DeShon is INNOCENT! After DeShon’s mother learned that State Attorney Willie Meggs had assigned Sheriff Larry Campbell’s son to prosecute the case against DeShon, she immediately thought, ‘conflict of interest.’ At the time, Sheriff Larry Campbell and State Attorney Willie Meggs were up for re-election. The job of Sheriff Campbell’s son, Assistant State Attorney Jack Campbell, was to make his daddy and his boss look great—to get re-elected by all means necessary. And when both Governor Rick Scott and Attorney General Pam Bondi chose not to get involved, Assistant State Attorney—Chief Prosecutor Jack Campbell withheld evidence—refused to allow the District Two Medical Examiner’s Office to release both victims’ autopsy reports—which is a violation of Florida’s Public Records law. Every attorney, private paid and court appointed grew frustrated with the judicial process. Leon County Sheriff’s deputies who were on the witness list committed perjury—their boss Sheriff Campbell were not going to hold them accountable for helping his son—who was in turn helping him get re-elected. State Attorney Willie Meggs was not going to prosecute any of Sheriff Campbell’s deputies who were helping his office, and Sheriff Campbell’s son win cases. DeShon Thomas and his family are faced with EVILDOERS!!!!!!!!! Almost immediately after Rick Scott was sworn into the Governor’s Office, Scott had been under investigation for violating Florida’s Public Records law. The same law violation that DeShon’s mother brought to Attorney General Pam Bondi’s attention. In 2014, a year after DeShon was convicted and sent into Florida Prison System, DeShon’s mother received a part of what she had requested from the District Two Medical Examiner’s Office three years earlier. One day DeShon’s mother pulled out an envelope from her mailbox. The envelope was from the District Two Medical Examiner’s Office. Inside of the envelope was a copy of Laqecia Herring’s Autopsy Report. Even after DeShon’s conviction, the District Two Medical Examiner’s Office is choosing to continue to support Jack Campbell’s violation of public records. DeShon’s mother requested from the District Two Medical Examiner’s Office by phone and email—Autopsy Reports of both victims—Laqecia Herring and Sterling Conner Jr.
Why was it ever an issue to release the victims’ autopsy reports? DeShon’s mother had been threatened with jail due to requesting a copy of the victims’ autopsy reports. DeShon’s mother paid Defense Attorney Gregory Cummings nearly $30,000—and even he refused to fulfill his obligations and withheld the victims’ autopsy reports from DeShon. The citizens of Tallahassee voted to end corruption in their city. Forty-four-year-old, John Emmett “Jack” Campbell was born and raised in Tallahassee—Leon County. In the primary election—Jack Campbell lost the Democratic vote in Tallahassee/ Leon County. Imagine that—a native—losing in his own hometown. Leon County is the only Democratic County in the panhandle of the six counties that make up the 2nd Judicial Circuit—all the five surrounding counties are Republican. Attorney Pete Williams, a Republican, was a candidate that received votes from both Democrats and Republicans in Leon County. Yet, Mr. Williams lost—more than likely because Scott and Bondi needed a safety net. The Florida Bar failed Pete Williams and Sean Desmond, and the citizens of Tallahassee/Leon County, and the citizens of Wakulla, Franklin, Gadsden, Jefferson and Liberty. Author MAUL10Posted on November 30, 2016 November 30, 2016 Leave a comment on Will Democrat State Attorney Win Reinforce Safety Net for Florida’s Republican Governor Rick Scott and Attorney General Pam Bondi? When a 30 year veteran State Attorney and his Chief Prosecutor does not recognize whose job it is to lawfully secure convictions of defendants that his/her office prosecutes, then it will be just a matter of time before droves of unlawful convictions will be overturned. In May 2015, the First District Court of Appeal overturned the murder conviction of Tallahassee resident, Kendrick Herring. In 2011, Kendrick Herring had been arrested and charged with numerous felonies, including murder. In 2013, State Attorney Willie Meggs’ Office got a conviction against Kendrick Herring—who was sentenced to Life in prison. Jeffery E. Lewis, General Counsel Office of Criminal Conflict and Attorney Melissa Ford represented Kendrick Herrings on his appeal. The First District Court of Appeal ruled in part the police should have received a search warrant before tracking Kendrick Herrings cell phone. In September 2016, two months ago, Kendrick Herring was released from prison. Last Saturday, on November 19, 2016, media sources such as the Tallahassee Democrat and WCTV News, reported that Kendrick Herring was arrested for his role as the getaway driver, in an attempted armed robbery at a Sunoco gas station in Tallahassee, that left a store clerk injured from a gunshot wound inflicted by the would-be robbery, and left the would-be robbery shot dead by the store clerk. While details of how the police connected Kendrick Herring to the robbery as the getaway driver was left out of the media reports, the media did quote State Attorney Willie Meggs and his predecessor, veteran Chief Prosecutor and incoming State Attorney Jack Campbell. In regards to Kendrick Herring, WCTV News reported Jack Campbell as having said, “We believed him to be dangerous then, and we believe him to be dangerous now.” Sadly, incoming State Attorney Jack Campbell missed how to lawfully show a defendant to be “dangerous” to society the first go around. And Jack Campbell’s statement, “…we believe him to be dangerous now,” is just a matter of underlining the ‘by any means necessary’ in order to score convictions, including breaking the law by violating people’s constitutional rights—innocent or not. Which is seemingly a normal practice that has been exercised in Florida’s Second Judicial Circuit under State Attorney Willie Meggs for more than 30 years. And now, since the First District Court of Appeal chose to try to clean up State Attorney Willie Meggs and Jack Campbell’s sloppy prosecution of Kendrick Herring, Jack Campbell, has foolishly slammed the First District Court of Appeal, the Conflict Counsel’s Office, and the Attorney General Office for the failures of law enforcements way of obtaining cell phone data and his and State Attorney Willie Meggs’ incompetence for disregarding unlawful acts before convicting Kendrick Herring to Life—risking the possibility that one day Kendrick Herring’s conviction could be overturned. Both Tallahassee lawyers, Sean Desmond and Pete Williams, who were contenders against Jack Campbell during the past campaign for Florida’s Second Judicial State Attorney, during open forums, both contenders pointed out Chief Prosecutor Jack Campbell and State Attorney Willie Meggs’ failures to properly communicate with law enforcement officials. But again, Jack Campbell would rather use his voice to point out other people’s failures—instead of recognizing his own. Tallahassee, FL—Citizens of Florida’s 2nd Judicial Circuit and all incoming college students at Florida State University, FAMU and Tallahassee Community College should brace themselves for more of the same old ‘Judicial Incompetence’ that has plagued the courtrooms of the Leon County Courthouse for more than 30 years under State Attorney Willie Meggs, especially now that The Florida Bar has failed to support its members, Tallahassee attorneys Sean Desmond and Pete Williams. With Assistant State Attorney Jack Campbell due to take office as Florida’s Second Judicial Circuit State Attorney in January 2017, the shooting last Saturday, November 19, 2016, that claimed the life of Tallahassee Community College student, 20-year-old, Matthew Brown, is an extension of how State Attorney Willie Meggs and his protégé, Chief Criminal Prosecutor Jack Campbell have a pattern of failing both victims, defendants, and the overall protection of innocent citizens. News media source reported that on November 19, 2016, a Sunoco gas station store clerk was shot by twenty-year-old, Matthew Brown during an attempted robbery. The store clerk then grabbed a gun from behind the counter—shooting and killing Matthew Brown. Reports also state that 26-year-old, Kendrick Herring, was arrested as the getaway driver. –In 2011, Kendrick Herring was arrested for shooting two men during a drug deal gone badly. One of the men died. –In 2013, Kendrick Herring was convicted on several felonies, including second degree murder. — In 2015, the First District Court of Appeal reversed Kendrick Herrings conviction citing police should have received a written warrant before they started to track his (Kendrick Herring’s) cell phone. –In September 2016, Kendrick Herring was released from prison. Also, on November 21, 2016, in regards to Kendrick Herring’s latest arrest, WCTV News quoted incoming State Attorney Jack Campbell as saying, “We believed him to be dangerous then, and we believe him to be dangerous now.” If in fact, State Attorney Willie Meggs and his Chief Prosecutor, Jack Campbell, believed Kendrick Herring to be dangerous back in 2011, why did the two “Tough on Crime” veteran prosecutors fail to make their case against such a dangerous man? Which would have possibly avoided a Sunoco store clerk from being shot, and putting the lives of innocent customers at the Sunoco in danger. Any freshman law student knows how important it is to secure a proper search warrant. In 2011, when police obtained Kendrick Herring’s cell phone data while investigating the double shooting, and murder of Timothy Andrew, and then brought that cell phone data to State Attorney Willie Meggs and Jack Campbell to obtain an arrest warrant for Kendrick Herring on murder charges, attempted murder and other drug related crimes, State Attorney Willie Meggs, a “Tough Prosecutor” and Jack Campbell seemingly failed to referring to Law 101, before seeking a Kendrick Herring’s life. State Attorney Willie Meggs and Jack Campbell’s arrogance reflects how they have been conducting the State Attorney’s Office unethically and unlawfully for more than 30 years and that’s why so many cases in Tallahassee mirror not so well rehearsed “Circus Performances.” If in fact Kendrick Herring had committed the crimes in 2011, then an ethical and lawful state attorney and an assistant state attorney practicing with some integrity, would have closely worked with the police to help them gather sufficient evidence to secure Kendrick Herring’s conviction, and Kendrick Herring’s conviction would have never been overturned on such a simple technicality—as failure to secure a search warrant. For more than a decade, Chief Criminal Prosecutor Jack Campbell has had the luxury of building up his conviction rate due to State Attorney Willie Meggs assigning cases to him to prosecute that were being investigated by his daddy, former Leon County Sheriff Larry Campbell. The majority of Jack Campbell’s trial witnesses were Leon County Sheriff’s Deputies. Cell phone data used in trials were excel spreadsheets created by Leon County Sheriff’s Criminal Analyst Leslie Raybon, and was said to be AT&T cell phone data. Complaints of fraud and perjured testimony committed by numerous Leon County Sheriff’s Deputies were never addressed. Dr. Anthony J. Clark with the District Two Medical Examiner’s Office had a complaint of perjury filed against him with the Florida Department of Law Enforcement Office in Tallahassee that went unaddressed. Both State Attorney Willie Meggs and Assistant State Attorney Jack Campbell had complaints Ethics Complaints filed against them—the results-unfounded. Former Leon County Sheriff Larry Campbell, now deceased, allowed Leon County Sheriff’s Detective Dawn Dennis to notarize documents that were fraudulent—those fraudulent documents were then signed by Assistant State Attorney Jack Campbell, who then signed the documents before taking the documents to be signed by county and circuit judges, before filing them with the Leon County Clerk of Courts. Governor Rick Scott, a criminal in his own right, and Attorney General Pamela Jo Bondi, another criminal in her own right—have refused to address the issues that are clearly a blueprint for more injustices to come. Apparently, the Florida Legislature does not find it unethical and immoral for a son to prosecute cases under the investigative jurisdiction of his sheriff daddy. Though the Florida Legislature find it be problematic for employees to sell Girl Scout cookies on government property—it’s a written statue. On July 9, 2015, less than three months after being released from prison, 21-year-old, Walter Cole Rayborn, was arrested by the police for the double execution-style murders of 21-year-old, Cornellius Poole and 22-year-old, Lance Love. According to reports, on July 5, 2015, officials with the Tallahassee Fire department were responding to a call about an apartment fire when they found the victims’ bodies in a bathtub—they had been bound and shot execution-style. Walter Cole Rayborn had a long juvenile criminal record before entering into the adult judicial system. Walter Rayborn, who is a member of a local prominent family, had been pacified by judges, Leon County Sheriff Larry Campbell, who was the overseer of the Leon County Jail, and both Assistant State Attorney Jack Campbell and State Attorney Investigator Jason Newlin. That’s probably why in Walter Cole Rayborn’s mind, his serious criminal charges and arrests were more like a joke to him. He was probably so comfortable committing crimes because he may have believed that he had all of the authority figures in the palm of his hands.Below is a past mugshot of Walter Cole Rayborn along with some of his past charges. While it has been reported and documented time and time again, how State Attorney Willie Meggs and Assistant State Attorney Jack Campbell “wheel and deal” with criminals at the risk of public safety, everyone who are paving the way for injustice to continue will have/ and already have a heavy burden to bear. Seemingly, incoming State Attorney Jack Campbell was quick to be very vocal about the First District Court of Appeals’ ruling in regards to Kendrick Herrings conviction being overturned. However, not so vocal last year after his buddy, Walter Cole Rayborn was arrested and charged with Two Counts of First Degree Murder. In fact, State Attorney Willie Meggs or Jack Campbell or someone in Willie Meggs’ office quickly Sealed Walter Cole Rayborn’s court records. As Walter Cole Rayborn sits in the Leon County Jail, his home away from home, awaiting trial in the double execution-style murders of Mr. Poole and Mr. Love, how will State Attorney Jack Campbell “order judges” to handle Walter Cole Rayborn’s defense attorney, witnesses, and evidence in the case? Tallahassee, FL—In less than a month of Dawuan Najee Williams’ apprehension by the U.S. Marshal’s Southeastern Regional Fugitive Task Force on two separate warrants in Tallahassee/ Leon County for armed bank robbery, ASA Jack Campbell, along with State Attorney Investigator Jason Newlin made deals with Mr. Williams, who had already been convicted of several felonies. Mr. Williams was released from the Leon County Jail, which was under the operation of Jack Campbell’s dad at the time, former Leon County Sheriff Larry Campbell. Upon Mr. Williams’ released, Mr. Williams received money and other provisions from State Attorney Willie Meggs’ Office and the Leon County Sheriff’s Office. When Mr. Williams’ money ran out, Mr. Williams returned to the life of crime in another county, and was again arrested. However, with Jack Campbell in debited to Mr. Williams, Jack Campbell and former Second Judicial Circuit Judge Jackie Fulford pacified Mr. Williams’ with special provisions. Mr. Williams may not have been involved in the latest shooting of Deputy U.S. Marshal in Georgia, but like the fugitive who claimed the life of U.S. Deputy Commander Patrick Carothers, Mr. Williams too had an extensive criminal history. Once again, since mid-November 2014, the wife and children of fallen Leon County Sheriff’s Deputy Chris Smith will be forced to brace themselves as they try to move through the holiday season without him. Seemingly, former Deputy Chris Smith’s death may have been avoided had there been checks and balances within the Leon County Sheriff’s Office. In 2012, shortly after then Leon County Sheriff’s Deputy Larry Campbell was re-elected into office, Sheriff Campbell announced that his cancer had returned. Many within Sheriff Campbell’s inner circle may have known that it was Sheriff Larry Campbell’s wish to die while in office. Fast forward to the mid-morning hours of November 22, 2014, the day when media reports stated that Leon County Sheriff’s Deputy Chris Smith and Leon County Sheriff’s Deputy Colin Wulfekuhl were ambushed by a lone gunman known as having been a threat to law enforcement officers and first responders. Deputy Chris Smith was killed. And Tallahassee first responders were kept away from the immediate scene. Leon County Sheriff Larry Campbell did not make an appearance or hold a press conference until 24 hours after Deputy Chris Smith’s murder. At the press conference, a spokesman for the Leon County Sheriff’s Office spoke the most, while Leon County Sheriff Larry Campbell leaned back against the wall for support. Sheriff Larry Campbell appeared to have been dressed by someone else or with assistance. Sheriff Larry Campbell also appeared very frail, his slurred words were inaudible. Deputy Chris Smith’s death revealed Sheriff Larry Campbell’s severe lack (possibly absence due to battle with cancer) in leadership at the Leon County Sheriff’s Office. Governor Rick Scott, whose governor’s mansion is located within two miles from the Leon County Sheriff’s Office and the Leon County Courthouse, did not come to the press conference to speak with the media. According to reports, no one including Jack Campbell informed Governor Rick Scott of Sheriff Campbell’s failing health. The next month, in December 2014, Leon County Sheriff Larry Campbell died. Sheriff Larry Campbell’s wish to die in office was fulfilled, but with an extremely high price. Many Tallahasseans know that State Attorney Willie Meggs has been grooming State Attorney Jack Campbell to be his successor after his retirement. State Attorney Willie Meggs has been in office for more than 30 years. In 2001, Jack Campbell began working for Willie Meggs as an assistant state attorney, while Willie Meggs’ son and daughter worked for Jack Campbell’s dad, Leon County Sheriff Larry Campbell as sheriff’s deputies. State Attorney Willie Meggs assigned Jack Campbell to prosecute many cases that were being investigated by the Leon County Sheriff’s Office. Jack Campbell, a native of Tallahassee, along with his dad, and State Attorney Willie Meggs’ and the Meggs family, have high terroristic like influence over the citizens in Tallahassee/ Leon County. Jack Campbell used many of his dad’s employees at the Leon County Sheriff’s Office to commit perjury and smuggle contraband into the Leon County Jail, and Jack Campbell has had Dr. Anthony J. Clark with the District Two Medical Examiner’s Office, (who may be affiliated with Tallahassee Memorial Hospital) to commit perjury –in order to secure conviction. The Florida Bar and the Commissions on Ethics have dismissed complaints against Jack Campbell. The complaints filed against Jack Campbell were similar complaints that have led to the disbarment and/or public reprimand of other attorneys in Florida. A lot of college students fear going to the police due to becoming victims of the very judicial system that is supposed to be in place to protect them. Both Tallahassee Defense Attorneys Sean Desmond (Democrat) and Pete Williams (Republican) were failed by The Florida Bar as contenders to Florida’s 2nd Judicial State Attorney’s Office that would have lifted the decades old”terror threat / attack” off of many citizens in Leon County. Jack Campbell is supposed to take office as Florida’s 2nd Judicial State Attorney in January 2017 after having been elected—though losing to voters in Tallahassee. In the videos section on this page is a video of Jack Campbell admitting to ordering judges to appoint certain attorneys of his own selection to cases, and manipulating the pay codes with Public Defender Nancy Daniels to have those attorneys receive pay. The message Jack Campbell has sent to hundreds of local attorneys is that if you’re not one of his “favorites” or if you don’t “wheel and deal” with him, then you won’t feed your family, because The Florida Bar and no one else will protect you no matter what. Tallahassee, FL—PARENTS BE AWARE, PARENTS BE AWARE, PARENTS PLEASE BE AWARE!!!!!! TALLAHASSEE’S JUDICIAL SYSTEM IS A SCAM!!!!!!! INCOMING STATE ATTORNEY JACK CAMPBELL IS A LIAR!!!!!! FLORIDA HAS OVER 56 STATE PRISONS THAT NEEDS TO REACH CAPACITY. STATE ATTORNEY JACK CAMPBELL HAS A HISTORY OF ORDERING JUDGES AND DEFENSE ATTORNEYS AROUND TO SECURE CONVICTIONS—CHARGES INNOCENT CHILDREN AS ADULTS. DO NOT SEND YOUR BELOVED CHILDREN TO TALLAHASSEE UNATTENDED!!!!!!!! AGAIN, DO NOT SEND YOUR BELOVED CHILDREN TO TALLAHASSEE UNATTENDED!!!!!!!!!! THE FLORIDA BAR PROTECTS CORRUPT ATTORNEYS. FLORIDA’S GOVERNOR RICK SCOTT RECEIVES FUNDS FROM PRIVATE PRISON GROUPS—DO NOT SEND YOUR CHILDREN TO TALLAHASSEE UNATTENDED!!!!!!! THE CORONER WITHHOLDS AUTOPSY REPORTS. WEALTHY WHITE MEN ARE PROVIDED WITH LAW ENFORCEMENT BADGES (IMPERSONATE COPS) AND AUTHORITY TO MAKE UNLAWFUL ARREST!!!!!!! CELLPHONES ARE BEING TRACKED UNKNOWINGLY BY LAW ENFORCEMENT!!!!!!!!!! PERSONAL PROPERTY IS SIEGE WITHOUT A SEARCH WARRANT. SENDING YOUR CHILD TO TALLAHASSEE UNATTENDED WOULD BE A LIFELONG REGRET!!!!!!!! YOU’VE BEEN WARNED!!!!!!!!! FYI: Sean Desmond and Mr. Pete Williams are victims of The Florida Bar. 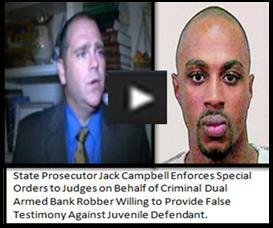 Jack Campbell should have never been allowed to run for State Attorney. This is how The Florida Bar victimizes its own members. Members are paying to be victimized. Jack Campbell has had Ethics Complaints and complaints filed with The Florida Bar against him. Both agencies have chosen to wash the complaints basically calling the complaints unfounded. This is an example of how the special favors go out to those with the most ties–Jack Campbell’s daddy was the Tallahassee’s (Leon County) Sheriff for over a decade–coupled with Willie Meggs specials. The truth is that one day those same complaints will be founded, they will just be at the expense of the life of another child or children. With The Florida Bar victimizing its own members–no surprise now to see that The Florida Bar has no problem with having chosen to sit back and allow defense attorney Greg Cummings to rob the mother of Tallahassee Community College freshman, DeShon Thomas, of nearly $30,000 without deposing a single witness or disclosing a single document. Greg Cummings may have split the money with Jack Campbell, Willie Meggs and Circuit Judge James C. Hankinson. Similar to the ‘Kid for Cash’ scandal. Click on link below. Examples: Twenty-three-year-old Rachel Hoffman died while HELPING law enforcement in Tallahassee.Seventeen-year-old DeShon Thomas cried after being sentenced to LIFE in prison for crimes that he DID NOT COMMIT. State Attorney Jack Campbell’s mental health seems to be equivalent to that of Ashton Sachs–Jack Campbell is a BOLDFACED LIAR. Tallahassee,FL—Forget protecting innocent children from being sent to adult prisons. Forget asking the Florida Department of Law Enforcement to investigate rogue law enforcement officials. Forget the whole “If you see something, say something” campaign launched by the Department of Homeland Security to encourage citizens in their communities to work together with their local law enforcement official to protect everyone. Forget all of the hundreds of full-time law abiding veteran law enforcement officials who specifically spent their whole life avoiding getting involved in criminal acts so that they could have a highly prosperous career as a bonafide law enforcement official under great leadership. Forget all of them! First of all there was absolutely nothing great about Leon County Sheriff Larry Campbell. Second, Governor Rick Scott chose not to get involved while former Leon County Sheriff Larry Campbell and his son 2nd Judicial Circuit Assistant State Attorney Jack Campbell, along with 2nd Judicial Circuit State Attorney Willie Meggs and 2nd Judicial Circuit Judge James C. Hankinson conspired together against a black youth. Seventeen-year-old, DeShon Thomas, who was a freshman at Tallahassee Community College, was charged in 2011 with Two Counts of First Degree Murder, Possession of a Firearm by a Juvenile Delinquent and Solicitation to Commit 1st Degree Murder. Governor Rick Scott was informed about the possibility of a conspiracy to railroaded DeShon into prison. Some of those named in the conspiracy were Circuit Judge James C. Hankinson and Jack Campbell. Governor Rick Scott claimed to not have gotten involved. However, almost instantly Circuit Judge James C. Hankinson was off of DeShon’s case. Circuit Judge James C. Hankinson had been presiding over DeShon’s case for more than 2 years as DeShon’s court process was a more like a “circus” performance. The tracks were set for DeShon to be sent to prison when seemingly nobody in the legislature—not even judges—reached out to help then Sheriff Larry Campbell and his son Assistant State Attorney Jack Campbell truly understand the unethical and immoral actions of an elected official (Larry Campbell) arresting citizens and his son (Jack Campbell) prosecuting the same citizens. This father/son team worked Tallahassee judicial system for more than a decade. This instilled fear in a lot of people—including defense attorneys and witnesses. Of course other officials that were either willing or were not aware of their wrongdoings played a role—the majority many of Jack Campbell’s witnesses were law enforcement officials who worked for his dad. In December 2014, Leon County Sheriff Larry Campbell passed away. The following month, Governor Rick Scott overlooked hundreds of qualified veterans within the Leon County Sheriff’s Office and appointed Mike Woods, as sheriff. A native of Tallahassee, as a 19-year-old, Mike Wood was the younger brother of a Leon County Sheriff’s Deputy when he was arrested on criminal drug charges. After getting his record expunged, Mike Wood became a Leon County Sheriff’s Deputy. According to reports at the time of Sheriff Larry Campbell’s death, Mike Wood had served 30 years as a Leon County Sheriff’s Deputy and was retired. Why Governor Rick Scott appointed Mike Wood, a Democrat, over all of those hard working bonafide sheriff’s majors/deputies is simple—Mike Wood was Sheriff Larry Campbell’s favorite cadet. And because so many people have been groomed to yield to State Attorney Willie Meggs, Sheriff Larry Campbell and his son Jack Campbell, it was Governor Rick Scott’s duty to yield to Sheriff Larry Campbell’s wishes—to have Mike Wood as sheriff. It was the same yielding to Sheriff Larry Campbell that may have played a major role in the ambush murder of Leon County Sheriff’s Deputy Chris Smith. On Tuesday night, Governor Rick Scott’s criminal appointee, Leon County Sheriff Mike Wood, who changed his party to Non-Affiliate, lost miserably to Walt McNeil, a Democrat. Tallahassee, FL—Democratic candidate, Jack Campbell, the son of former Leon County Sheriff Larry Campbell, has been elected Florida’s 2nd Judicial Circuit State Attorney. In the primary, Jack Campbell lost the Democratic vote in Leon County, but defeated his rival Democratic candidate Sean Desmond. Jack Campbell won the race on Tuesday night with the benefit of Leon County being a majority Democratic county. Pete Williams, a Republican who sought to defeat Jack Campbell, hoped to get Democrats to vote outside of their party, but with Leon County being the biggest and the only Democratic county out of the six counties that make up the 2nd Judicial Circuit, the majority of Democrats must have down voted Democrats on their ballots, thus, giving Jack Campbell the win. Jack Campbell is set to replace long serving Democrat State Attorney Willie Meggs. Jack Campbell, who has worked his entire fifteen year legal career as an Assistant State Attorney for Willie Meggs, has been pacified and well protected for many years by Leon County Sheriff’s Deputies, Leon County Judges, 2nd Judicial Circuit Judges and The Florida Bar. State Attorney Willie Meggs’ son and daughter worked directly under former Leon County Sheriff Larry Campbell, about the same time as State Attorney Willie Meggs was grooming his protégé Jack Campbell. For more than two decades State Attorney Willie Meggs and former Leon County Sheriff Larry Campbell governed Tallahassee citizens by instilling fear and intimidation to all of those who challenged the law. Inside of a courtroom at the Leon County Courthouse, Assistant State’s Attorney Jack Campbell ordered county and circuit judges to appoint attorneys that he himself hand-selected to represent inmates who’d agreed to help him plot against other inmates. These attorneys, who were paid for with taxpayer dollars, were improperly assigned cases to which they were not supposed to be assigned, but were in fear of speaking out against Jack Campbell and all of the judges who agreed to bypass proper court procedures. All sides of the courtroom operated according to Jack Campbell’s direction. Long serving Public Defender Lead Nancy Daniels worked with Jack Campbell by manipulating the pay codes to ensure attorneys otherwise not allowed to work cases outside of their scope were paid. This underhanded way of court procedure was not just unfair to defendants, but it was also unfair to the hundreds of attorneys who were being violated by judges in order to move Jack Campbell forward in his career. When Florida Attorney General Pam Bondi was informed of judges and prosecutorial misconduct occurring in the courtrooms of Leon County under Jack Campbell’s direction, Attorney General Pam Bondi deferred the complaint to the Federal Bureau of Investigation. Jack Campbell admitted to being the source of a murder plot against one of his own key witnesses when there was concern about the witness not providing testimony in the double murder trial against Tallahassee Community College freshman DeShon Thomas. At the age of 17-years-old, DeShon Thomas was hastily arrested by “Leon County Sheriff’s Detective Don Odham” and charged with Two Counts of 1st Degree Murder and Possession of a Firearm by a Juvenile Delinquent. A few months after DeShon’s arrest, DeShon’s mother started receiving text messages on one of her cell phones from a number that she did not recognize. The text messages were about murdering the one and only witness against DeShon. For about two weeks the same text messages continued to come to DeShon’s mother’s cell phone. By then, DeShon’s mother learned that State Attorney Willie Meggs had assigned Jack Campbell to prosecute the case against DeShon, and as a single mother, she was extremely concerned about DeShon’s safety inside of the Leon County Jail which was operated by Jack Campbell’s dad, as well as the safety for her and her other children. Prior to the threatening text messages coming to her cell phone, it was just a rumor to her about the threats and the intimidation that spewed out of State Attorney Willie Meggs and the Leon County Sheriff’s Office, now it was her reality. The only three new contacts that she had provided that particular cell phone number to was the Leon County Sheriff’s Office (specifically Detective Don Odham), the Public Defender’s Office and DeShon’s defense attorney Greg Cummings. Though some would think that a mother would want the only witness against her son murdered, not DeShon’s mother because DeShon’s mother knows better. Besides, she’d already talked to the young man, and she knew his fears of Detective Don Odham. After DeShon’s mother had several discussions with Greg Cummings, the text messages stopped. Every criminal case that was under the jurisdiction of the Leon County Sheriff’s Office and being prosecuted by Jack Campbell clearly opened up the judicial system to be used as a pit for the Campbell family to spar off against defendants’ families. Jack Campbell, whose dreams were set on some day becoming state’s attorney, won convictions by all means necessary—including having sheriff’s deputies and a doctor commit perjury, and using a law enforcement imposter– Leon County Sheriff’s Detective Don Odham to provide trail testimony. Over a year and a half, DeShon’s mother became very suspicious about the communication between Greg Cummings and Jack Campbell. State Attorney Willie Meggs’ Office refused to allow the District Two Medical Examiner’s Office to release the victims’ autopsy reports into Public Record. Greg Cummings refused to discuss the victims autopsy reports with DeShon and refused to provided DeShon and/or DeShon’s mother with a copy of the victims’ autopsy reports. After paying Greg Cummings nearly $30,000, DeShon’s mother filed a complaint with The Florida Bar against Greg Cummings, and told DeShon to fire him. Eventually, DeShon’s mother filed a complaint with The Florida Bar against Jack Campbell. Despite Greg Cummings having admitted to having violated The Florida Bar rules, The Florida Bar has failed to hold him accountable; choosing not to settle the matter. In regards to Jack Campbell, The Florida Bar continues to protect him, despite plotting a murder hit. DeShon was convicted and has been incarcerated for nearly six years. DeShon is INNOCENT! Being a registered Democrat led to Jack Campbell’s positioning to become 2nd Judicial Circuit State Attorney, but being a criminal will lead to his downfall and many of those in his circle, including those who continue to protect him and enable him to commit criminal acts. No matter how much time DeShon, an INNOCENT child (now young man) sits in prison—separated from his family, Jack Campbell and his enablers are still losers! The one thing that Florida Governor Rick Scott, a Republican, has taught many elected officials is to not speak when the deck is stacked against you. But the reality is there is no statute of limitations on a federal offense.